The National Institute of Hydrology and Water Management (INHGA) is a public institution and a subunit of the “Romanian Waters” National Administration, the national authority in hydrology, hydrogeology and water management. INHGA develops research activities and provides operational services of national and international public interest for the protection and socio-economic well-being of people. INHGA’s activities help improve peoples’ quality of life and help protect the environment. CLimate Change and Variability: Impact on Central and Eastern EuRope (CLAVIER), supported by the European Commission’s 6th Framework Programme. ENSEMBLES Based Predictions of Climate Changes and Their Impacts, funded by the European Commission and coordinated by the Hadley Centre for Climate Prediction and Research at the UK Met Office. PhD Sorin Teodor, scientific researcher, leader of the Hydrological Studies and Researches Department. He published one reference book and 2 practical guides regarding the improvement and the analysis of the data concerning the solid suspended discharge and the granulometry of the sedimental particles and more than 50 articles in hydrology. PhD Viorel Chendes Dr. Viorel Chendes is Senior Researcher, having major interests on surface water resources, hydrology models, flood assessment and GIS. He has acquired over 10 years of experience in these fields in the Institute of Geography, Faculty of Geography (“Spiru Haret” University), and Faculty of Hydrotechnics (Technical University of Civil Engineering). In present, he is the Head of G.I.S. Data Processing Laboratory from National Institute of Hydrology and Water Management (INHGA), preparing de GIS databases for hydrological studies (flood studies, analysis of catchments or rivers, topographic analysis, etc. ), their integration in the hydrological databases, development of some research projects, etc. 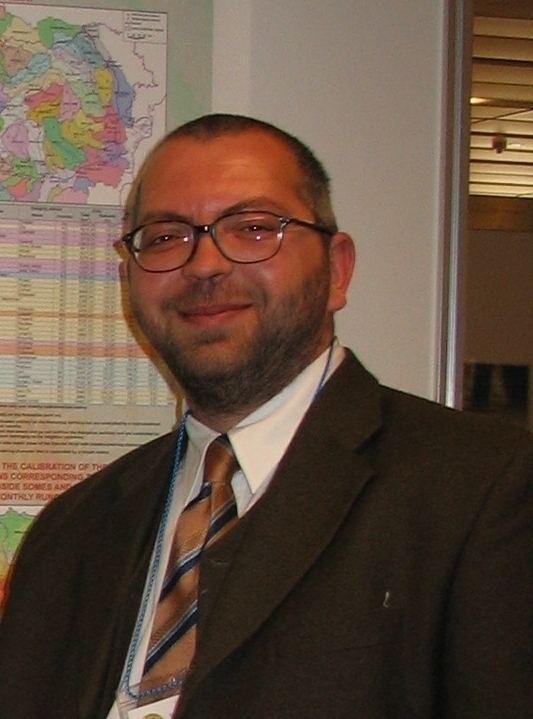 During 2003-2004, he has been involved in the co-ordination and development of an UNESCO Project: “The elaboration of the graphic database of the Romanian hydrological network (Danube tributaries and main rivers belonging to Romania)” as a support for the project “Basin-wide water balance of the Danube river basin”, in the framework of the International Hydrological Programme (IHP) UNESCO. In 2004, together with other experts from INHGA, provided consultancy services in connection with EuropeAid/114577/D/SV/RO – RO 0103.03-02 “Protection of wetlands of the Danube – a pilot project for Cama Dinu islets area”, co-ordinated by Haskoning Nederland BV. His PhD thesis (2007) had the title „The runoff and suspended load in Bend Subcharpatians”, is based entirely on the applicability of GIS methods and techniques in hydrology. The spatial distribution of many physico-geographical factors and their analysis in GIS system, including spatial statistics, has allowed the development of new relationships between them and the different components of runoff and suspended load. He is involved in EnviroGRIDS in WP4 – Hydrological catchment models, especially in Task 4.1 – Data collection for SWAT. is the head of GIS Data Processing Laboratory and a senior researcher. His research interest is the transpose of hydrologycal application in GIS environment. PhD Borcia Constantin is a Senior researcher in INHGA and the his main expertise is in the area of centralizing and processing data regarding the hydrology, chemistry and radioactivity of the Danube, Danube Delta and the Romanian seacoast of the Black Sea water and sediments. INHGA is leading the task on data collection for WAT modelling in WP4, as well as participating to the calibration of the hydrological models (task 4.1 and 4.2). INHGA is also involved in the task 6.3 on BSC Observation System for citizens.